Preheat the oven to 170°C, gas mark 3. Heat 2 tbsp of the oil in a heavy-bottomed casserole then brown the meat in batches. Remove with any juices and set aside. Add the remaining oil to the pan and fry the vegetables for 1–2 minutes until lightly coloured. Pour in the stout and stir to scrape up all the flavour from the bottom of the pan. Add 750ml cold water, return the browned beef and season. Bring to the boil, then immediately turn down the heat. Cover and cook in the preheated oven for 2-2¼ hours. Check a couple of times during cooking to make sure the mixture hasn’t become too dry. Add more water if necessary. Meanwhile, make the dumplings. Sauté the onion in the butter. Place in a bowl and add the rest of the ingredients. Bring the mixture together, using damp hands, and form into about 12 golf ball-sized dumplings. The mixture will be rather loose, but persevere. Take the beef out of the oven and place the dumplings on top 30 minutes before the end of cooking time. Return to the oven, uncovered, for the final 30 minutes. If freezing, remove the beef from the oven after 1¾ hours in the oven, cool completely, then freeze. Only make the dumplings after defrosting and reheating the stew. 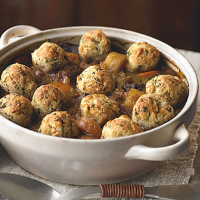 To cook after defrosting, heat gently on the stove top, add the dumplings and place, uncovered, in an oven preheated to 170°C, gas mark 3 for 30 minutes.